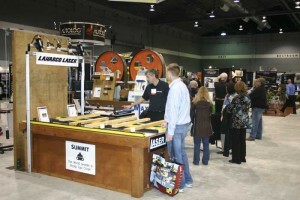 The first Timber Processing & Energy Expo in Portland, Ore. delivers excited visitors and exhibitors. 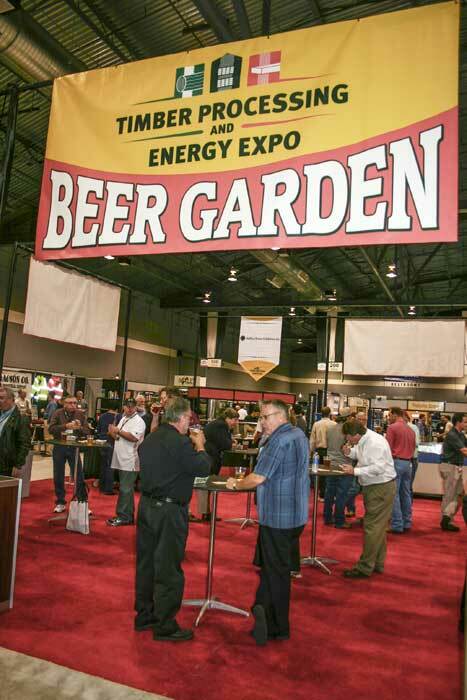 More than 1,000 attendees—including representatives from 115 wood products producing companies and 200 specific mill site operations—from 30 U.S. states and five Canadian provinces traveled to the first Timber Processing & Energy Expo and brought with them a display of optimism that has long been missing in the industry. 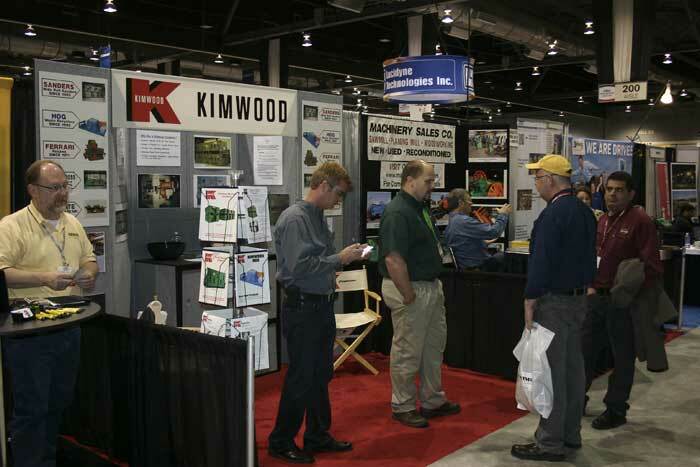 One-hundred sixty-two (162) exhibitor companies used up 43,000 square feet of the Portland Exposition Center to display and demonstrate their machinery, technologies, supplies and services to mill company personnel during October 17-19. 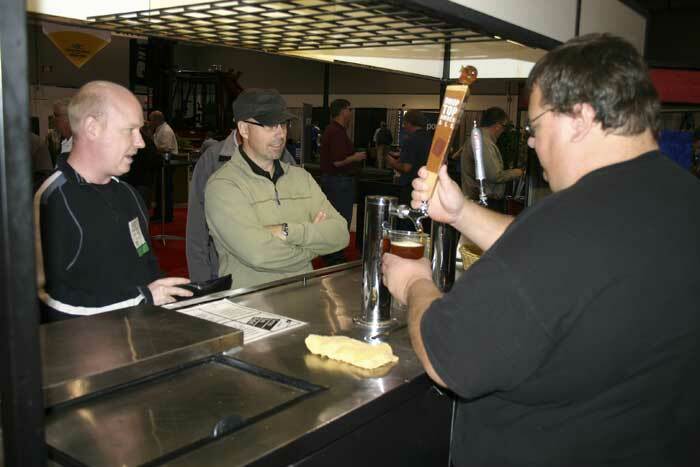 The combined attendee and exhibitor attendance of approximately 2,000 was buoyed by a brightening economy and pent-up demand for forest products mill improvements. 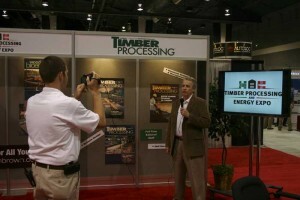 The event focused on the sawmill, panel mill and wood energy sectors of the forest products industry. Timber Processing, Panel World and Wood Bioenergy served as media hosts, for the event, which was produced by Hatton-Brown Expositions LLC. The event also featured a Workshop Day, in which more than 200 people attended any of the 16 seminars that covered sawmill scanning and optimization, machinery alignment, wood dust issues, veneer lathe and dryer technologies and opportunities for biomass utilization. Comfortable temperatures and sunshine throughout most of the event also lifted the spirits of showgoers, who have suffered through one of the worst economic downturns ever, accentuated by a severe drop in housing starts during past several years. Show Director Rich Donnell says one of the most positive comments he heard about the event was from an exhibitor who said he hadn’t seen such geographical representation at a machinery expo in many years. Donnell also says he was very pleased that exhibitors and attendees for the most part had high praise for the Portland Expo Center as the location of the event. Opticom Technologies’ products are carried by Platt Electric Supply, a major vendor of mill electrical and electronic systems and components. 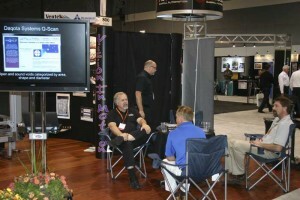 Platt’s Brian Casey noted the company had a great show and garnered plenty of leads. “We had a very meaningful experience here,” he said, adding that Platt would be looking to get a larger booth in the future. 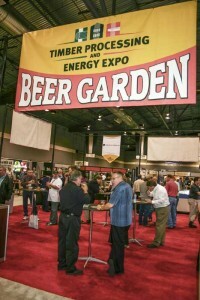 JoeScan’s Joey Nelson said he liked TP&EE’s location at the Portland Expo Center, with easy access. “We also saw a good quality of visitor, and there are a lot of people looking at doing mill projects,” Nelson said, adding that the show provided his company with an opportunity to increase brand name recognition. Sering Sawmill’s Ryan Perry said it was great to once again have a trade show in the Pacific Northwest—but he was really surprised at how many visitors he saw who were from other regions. “We got to meet a lot of new prospects, and getting a chance to network with other companies was also good,” he said. USNR’s Paul Strebig demonstrated the company’s new TransLineator board feeding system with Micro-Gapping. The process uses angled rolls to move boards from transversely to lineally through a planer or other processing machine and back to transversely. Striebek says it’s a space-saving design while at the same time speeding up the line. 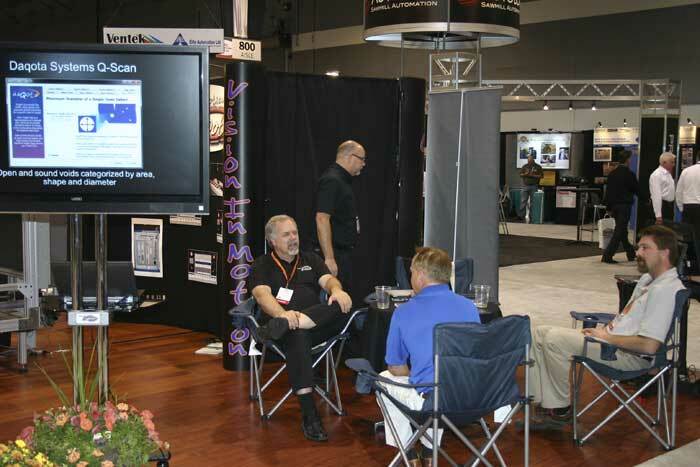 USNR featured a tremendous range of technologies at its display, which was the largest on the floor. 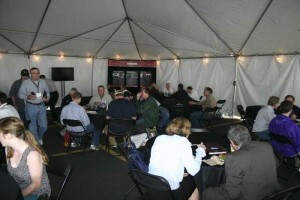 The company also maintained a hospitality tent in the outdoor exhibits area. Arrow Speed Controls parked its Mitsubishi electric automation mobile truck in the outdoor lot, displaying, PLCs, VFDs, servos and a robot inside the truck. The company also provided food and beverages for visitors throughout the show. 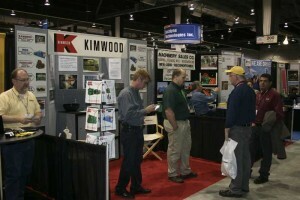 Many of the primary equipment manufacturers in the panel industries exhibited their technologies. USNR reported that RoyOMartin’s southern pine plywood plant in Chopin, La. is starting up a six-deck jet dryer. The dryer was constructed adjacent the line where it went, and actually slid into place, thus minimizing line downtime. USNR is also upgrading a particleboard press at Roseburg Forest Products in Dillard. Westmill Industries is rebuilding a dryer at Boise’s softwood plywood plant in Louisiana, converting it from steam to gas. The company continues to promote its LightSort green veneer moisture content measurement technology, which is based on light transmission, enhancing green veneer stacking. The company also touted its feed forward dryer control. Ventek promoted its multi-point diverter system, which sorts trash at the clipper and put it in the trays. Con-vey displayed a four axis Kawasaki robot as part of its material handling technologies. The company reported numerous inquires for potential projects in 2013 and 2014. Hyster displayed its new Tier 4 28,000 lb. truck, the H280HD. Chris McMullen of exhibitor Precision Energy Services thought the show provided a good forum for potential customers to see what the company has to offer. The engineering, procurement and construction company specializes in biomass and can contribute engineering and design services or oversee a complete project if needed. “We’ve been working on a lot of smaller systems for projects in Montana, Vermont and Canada,” McMullen said, adding that the company also worked on a project near the TP&EE Portland show site, in Warrenton, Ore., that included disassembling and moving a boiler from Montana to Hampton Lumber’s sawmill on the Oregon Coast. Cole Martin of exhibitor Dieffenbacher North America emphasized the company’s growing reach into the wood bioenergy sector, including the introduction of a new pelletizer that provides significantly greater capacity from one machine than conventional systems. Dieffenbacher also offers heat energy and drying technologies and Martin says Dieffenbacher has become a full line supplier of machinery to the wood pellet market. Dieffenbacher is a long-time manufacturer of machinery for wood-based panels production. All the way from Monroeville, Ala., J.P. Brooks with Harrigan Lumber said he was looking for ideas for the future with upgrades planned for bandmills and filing room equipment. “We’ve seen a lot of good equipment and technology that’s different and new,” Brooks said. Berkholtz made the trip to TP&EE from British Columbia, where Pinnacle operates six pellet plants with more than 1 million ton annual capacity. The company is working on a project to redevelop and upgrade a marine shipping terminal at Port of Prince Rupert, BC, in order to boost the company’s pellet export activities. During TP&EE’s workshop day, longtime biomass power and cogeneration expert and consultant Bill Carlson of Carlson Small Power Consultants delivered a presentation on the potential for cogeneration at traditional forest products manufacturing plants. 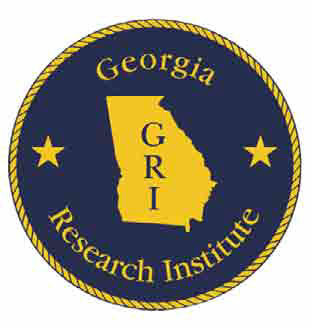 Carlson noted that in many respects there are good reasons for a mill to add cogeneration, among them the increase in renewable portfolio standards in many states, plus continued consumer interest in voluntarily purchasing green power and volatility in fossil fuel prices. Many mills are in need of boiler upgrades that could spur cogen projects, Carlson added. Plus, many mills are looking at reduced residuals markets and transportation costs that favor dry over green products. Utilities companies are also more favorable toward biomass, which has baseload firing characteristics similar to coal, and cogen plants fit well into existing power transmission infrastructure, Carlson said. The best candidates for cogen projects, Carlson said, are medium- to large-size mills with older boilers that need to expand dry product volume and are facing poor residuals markets. Such an operation should also have operational control of slash volumes through land ownership or logging contracts—and ideally be working with a utility that’s looking to expand renewable power purchases through a strong local infrastructure. Keys to a successful project include not going too large—5-20 MW plants are probably best, and much larger tends to generate local opposition. “The size of the project should increase byproduct flexibility, not eliminate it, and help build a price floor but not a ceiling,” Carlson said. Scott Horton of USNR told how his company is developing systems that take advantage of most mill employees’ overall familiarity with computers, which provides more opportunities on the mill floor to benefit from vision and optimization. “The new generation of scanning and optimization provides better information to the guys on the mill floor, with each piece being tracked through the system,” he said. JoeScan President Joey Nelson gave a presentation detailing some of the technologies and options available to mills when determining the best way to go on a scanning or optimization project. Lucidyne researcher Andreas Buers promoted a balanced approach to optimization that melds both production- and sales-focused optimization strategies by employing consistent parameters across all optimizers and increased use of simulations to boost system accountability and predictability. Microtec’s Norbert Oberaigner gave a profile of his company’s history and its efforts in developing a sophisticated multi-sensor scanning system that combines infrared, 3D and x-ray technologies. Gale Miller of Autolog gave details on the features and benefits of Autolog’s new Hi Density 3D Transverse Optimizer with split detection capability. A presentation was also made on machinery alignment by Dave Halstead in cooperation with Brunson Instrument, while Chris Lambert of Lacey-Harmer spoke on bandmill cutting optimization. The ever important topic of wood dust was addressed by Chris Chathams of Timber Products Manufacturers Assn. and Brad Carr of Integrated Environmental Solutions. Representatives from Daqota Systems, Delta Computer Systems, Westmill Industries and USNR addressed veneer lathe and dryer technologies.